The UPS project is nearly complete. The UPS and monitoring hardware arrived from eBay. The UPS was in its original box as advertised, and many of the components were unopened. 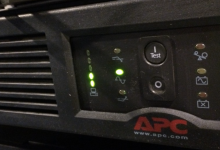 The RBC43 APC battery pack, however, was dead. I expected as much — even if the whole unit was new, sitting idle a battery pack optimistically would have a shelf life of 18 month. Upon dis-assembly, the first thing I notice other than the weight of the unit, was that the pack was lableled as 48V, so I’m going to need some more batteries. After I had the RBC43 out, I can’t say it was OEM. None of the batts in the pack were labeled APC, and in contrast to the rest of the unit, the batts had a layer of dust on them with fresh finger prints. Someone probably swapped packs with it. Otherwise I think the unit was never used, there was no scarring on the receptacle pins or scratches from being put int he rack. The pack was putting out at tad over 30v, this meant there might be some batts I could salvage in it, but it also meant that the UPS wouldn’t start as that’s below its safety voltage. I hotwired it with 4 known working 12v ups batts. It powered up just fine, and checked out okay via the USB connection. The mfg date on the box and receipt matched that of the firmware, 6/2003. I then put in the monitoring cards, this took a while as they didn’t work quite right at first, but after finding the well hidden APC ‘multiple smart-card installation procedure’ guide, and finding that the environmental monitor needed to be installed ‘closer’ to the UPS than the network card, all was well. I tested the general operation and all the open/close contact monitors, as I plan to hookup water and motion detectors at some point. Then I had to get 2 more batteries, and find a bigger enclosure. I also picked up a bit more wire, a wire cover, and some more connectors. Once I had 4 Energizer E29HM 125ah batteries, I charged them all with an external charger until they were taking < 2amps of charge. The RBC43 claims to provide 480 volt-amp-hours of power, the E29HMs should provide 6000. I’ll have to monitor it, but the RBC43 should be able to provide 80% of that number with several hundred cycles. The E29HMs would only manager 150 or less cycles at 80%, but at 50% should do 500+. 80%*480 is 384, vs 3000 for the E29s. Advertised run time with a 50% load is 11.5 mins, I should get 8x that, or 90 mins, before endangering the E29s. Regardless I’m going to have to calibrate it to find out, and probably calibrate it at least twice, so there are two 80% cycles the E29s will endure. I’ll add some images of the finished project soon. Assembly was pretty straight-forward, looping the + to the – of the next battery and connecting the remaining + and – to the ups. I removed the 100am 32v fuse block from the standard APC RBC43 pack, and put it in line with my new flooded pack. I ‘tapped’ the input wires past the connector, so I could still hook up an internal pack if I ever wanted to, and then drilled a small hole at the bottom fo the face plate to run the cables and cable cover out and over to the battery box. After < 2 hours the unit showed 100% charge — though I wasn’t so sure since most of the batts were still taking 1.8-1.5 a from the charger before I put them in. Regardless I can a calibration. Not surprisingly it took a few hours to run it down. It’s been about 9+ hours now since it completed and it’s showing a battery charge of only 66%, and a runtime of 153min — or about 3.85hours once fully charged. I did monitor the UPS temperature while it was running to be sure it didn’t overheat, it never got > .5C over room temp. I also checked the temps of all my external wiring, and while the 48V run to the UPS did heat a bit, it never got more than slightly warm to the touch. Likewise I monitored the batts for the first couple of hours of recharge, and they didn’t seem to heat or outgas at all — didn’t expect they would since the big charger at 12amp is undoubtedly delivering way more current than the APC. So for the most part the project is done. Still waiting for the PDU, and will move in a few more items from elsewhere — router, dns host, etc. Still don’t have a home for the 85ah powered Conext, but I’ll probably put the wimax and trango units on it.